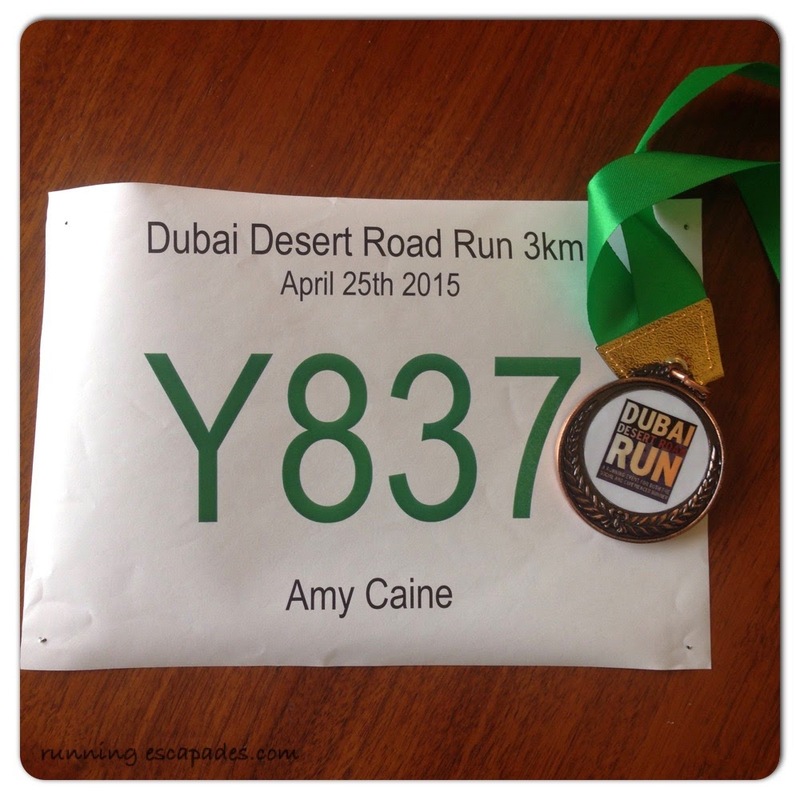 As much as I want to run all around Dubai, it's just not that easy. Location, no car, heat. It's complicated. 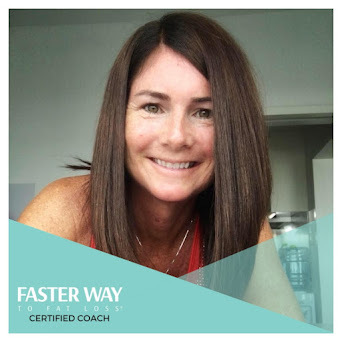 So this morning instead of running circles around the track at the park again, I decided to do a Nike Run Club workout and this one came to my inbox. So I was all dressed up in my Oiselle and had the fitness center to myself which meant...#gymselfie time! Then it was time to get down to business. 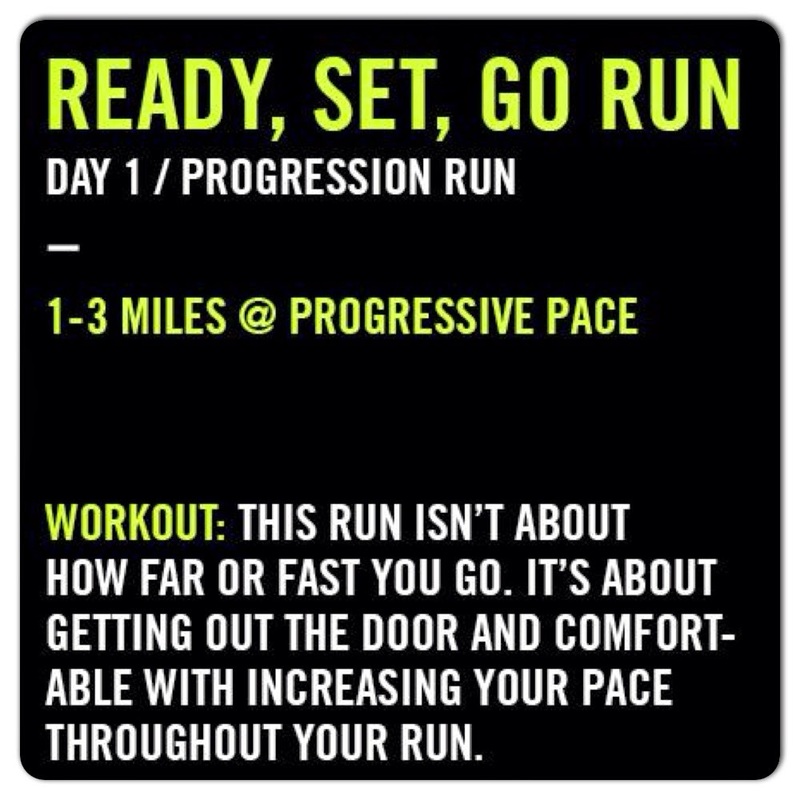 My plan was to run for 30 minutes, but everything was feeling good so I went for 10 more...and 10 more. 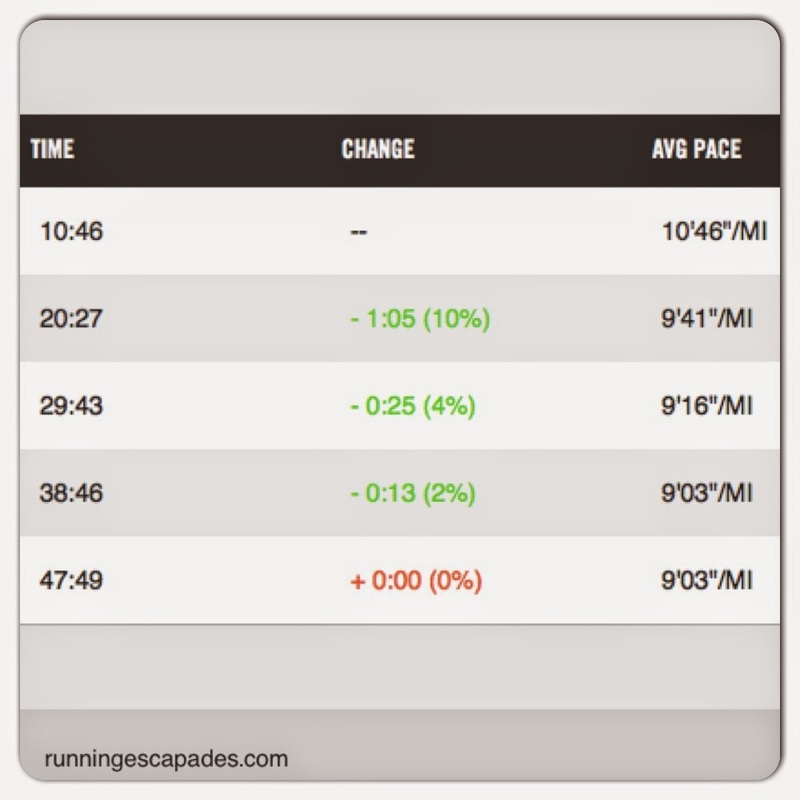 I eased into the run and then increased my speed every mile by 4 km/h. 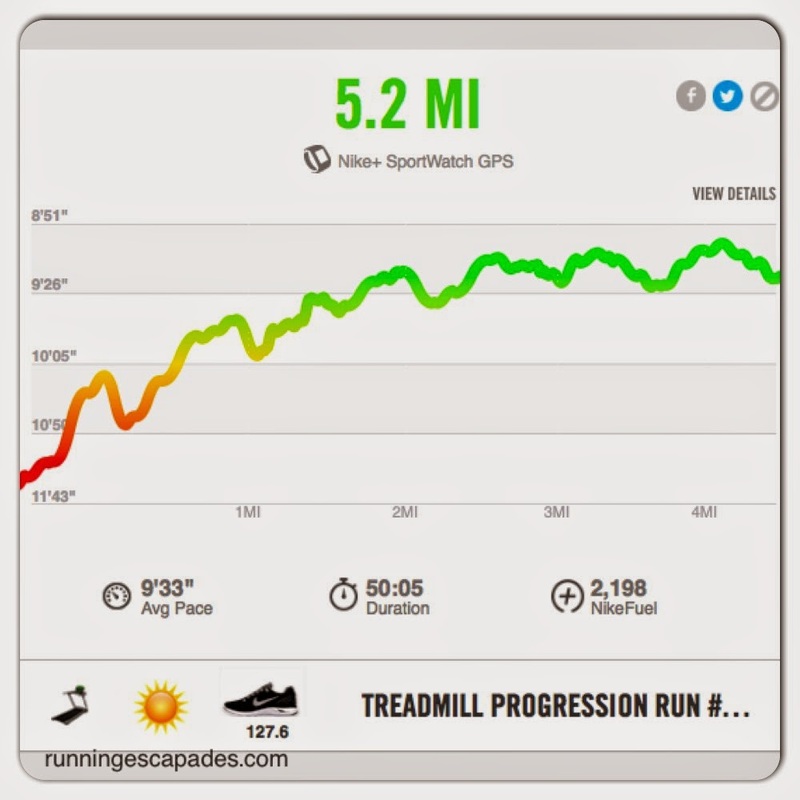 I've never used a treadmill with km settings, so I was making all of my choices based on feeling. 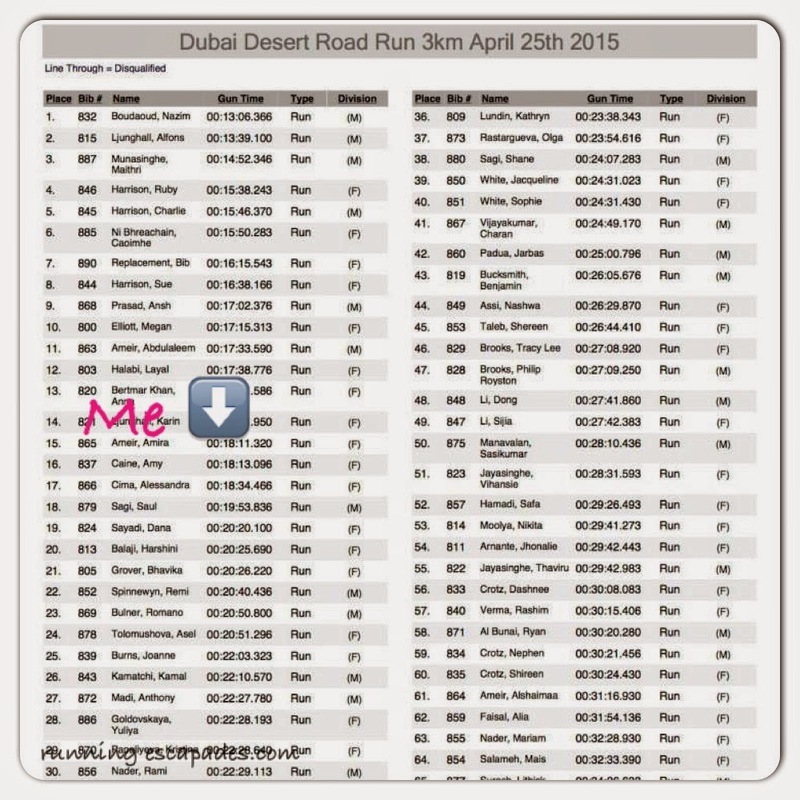 This was my best run since getting to Dubai. 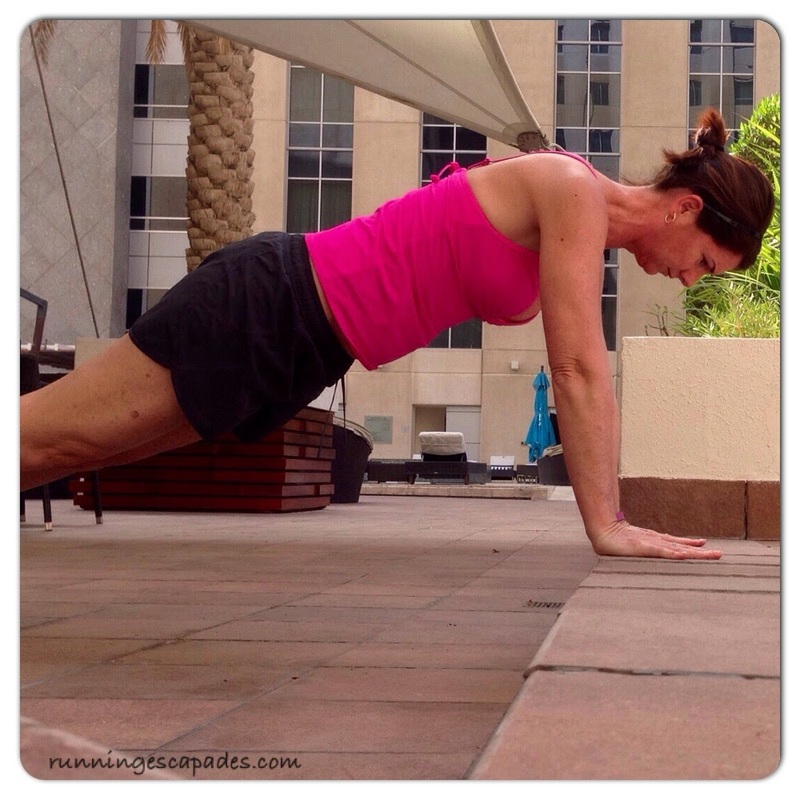 I finished up my workout with a quick set of planks and a good stretching session before hitting the pool for some recovery time. How do you like to recover after a good workout? 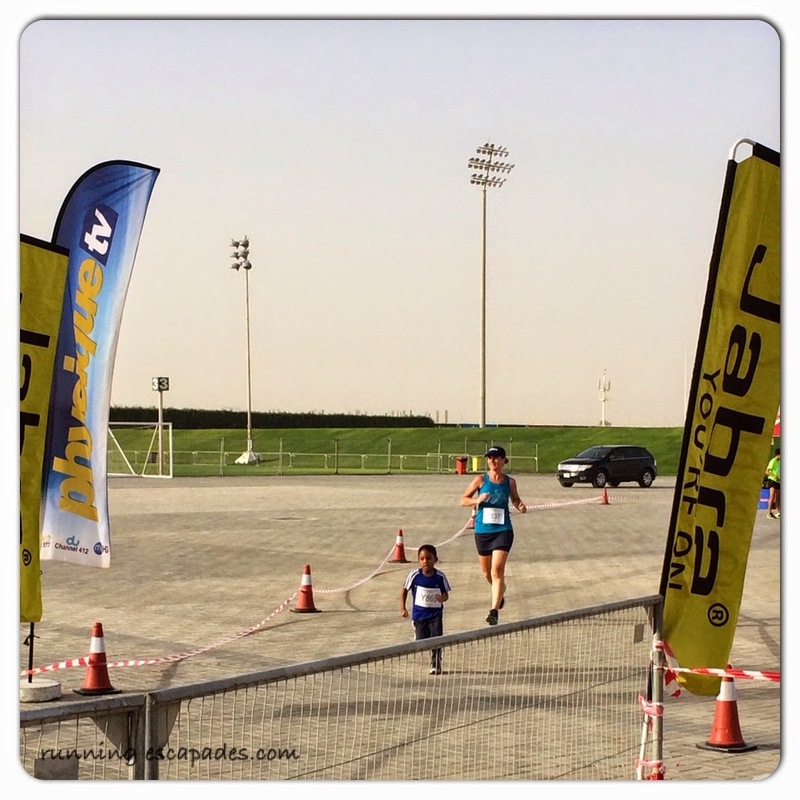 I'm super excited to write a race recap about my first race in a new country! The race was held at The Sevens Stadium about 30 minutes from our hotel. 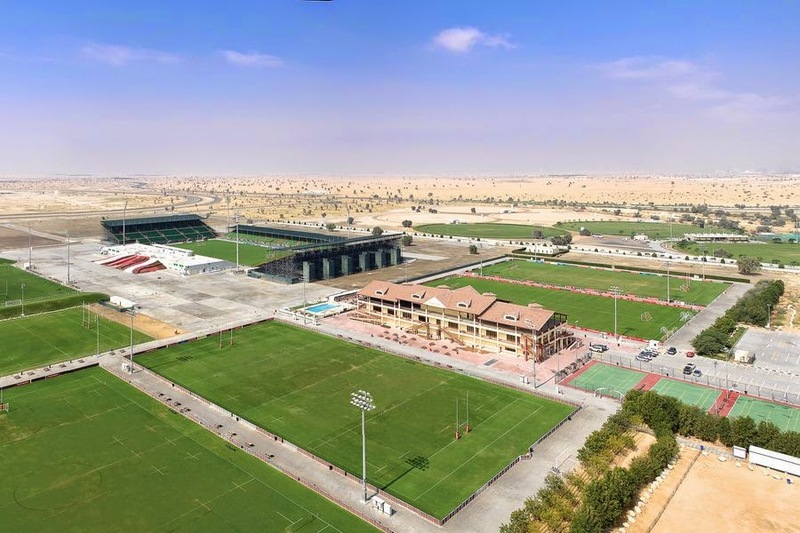 The Sevens is a multi-purpose sports complex with fields used for rugby, soccer, football, tennis, track & field and concerts. As you can see in the picture below, the venue is literally surrounded by desert. Appropriately, there is even a camel racing club next to it. We took a taxi to the race and had plenty of time to pick up my bib, look around, and get ready for the race. Even though the venue was kind of fancy pants with changing rooms and showers available, the race itself was pretty simple. I like simple. 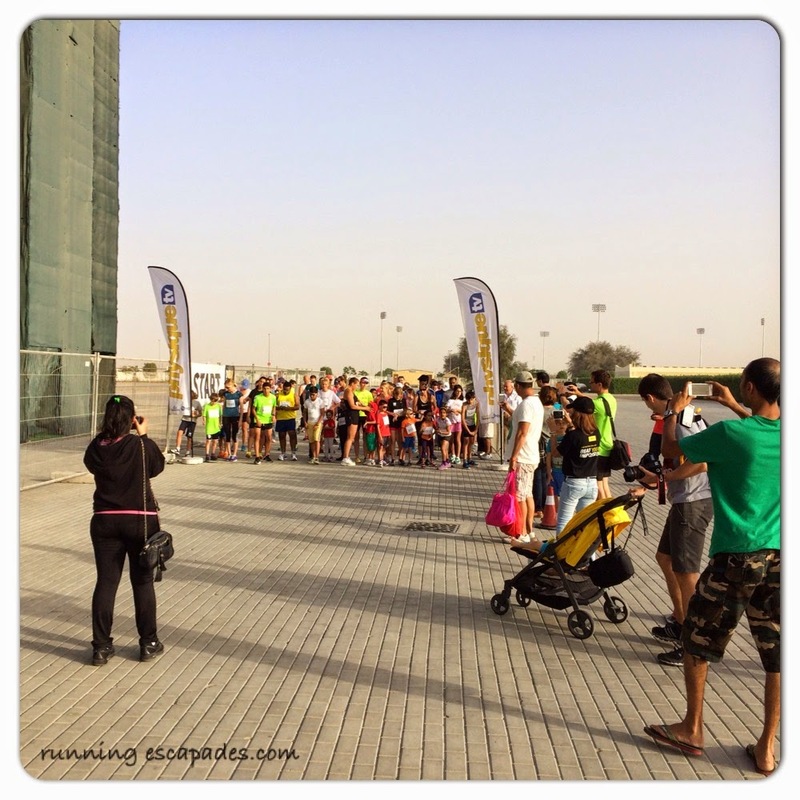 The 10K runners started promptly at 7AM followed immediately by the 3K at 7:05AM. The course for both races began behind the grandstand and led runners out of the stadium complex onto traffic free back roads. The race was quiet. Most of the spectators stayed near the grandstand where they had music at the start/finish area, so the only people out on the course were runners, photographers, and aid station volunteers. 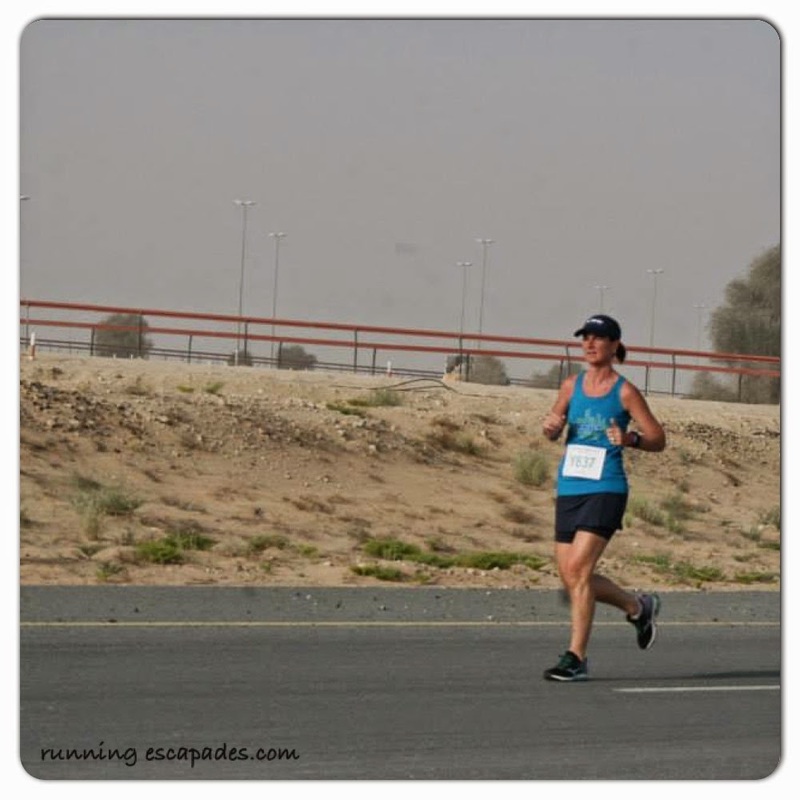 Running toward the 3K turn-around, all I saw was flat brown sand and groups of camels. The camels were on the other side of the fence to my right. Even at 7 o'clock in the morning it was warm. 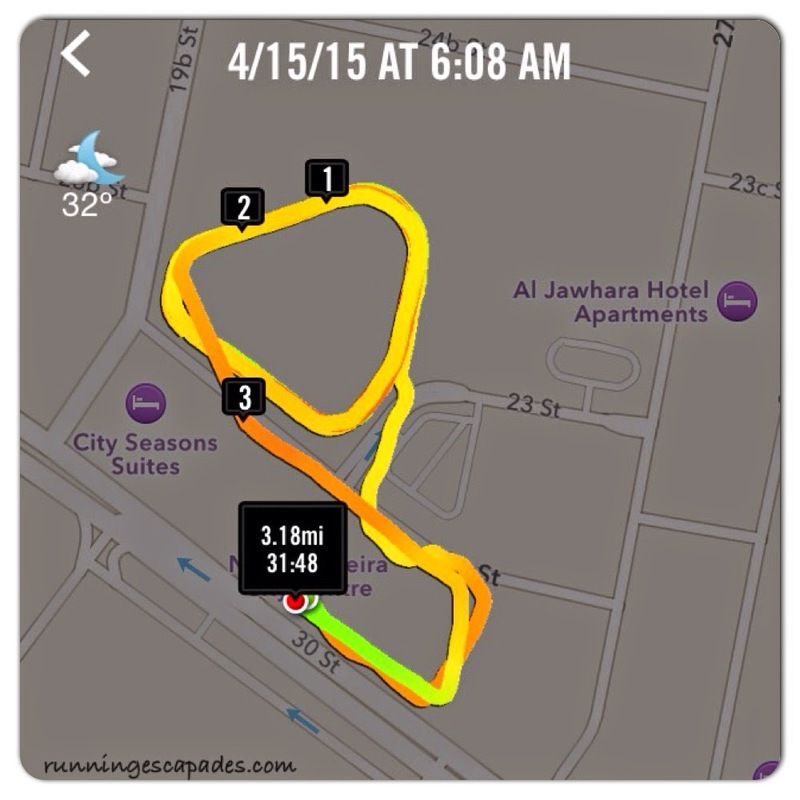 As I ran toward the finish, I was glad that I chose the 3K. My results were much better than I expected. 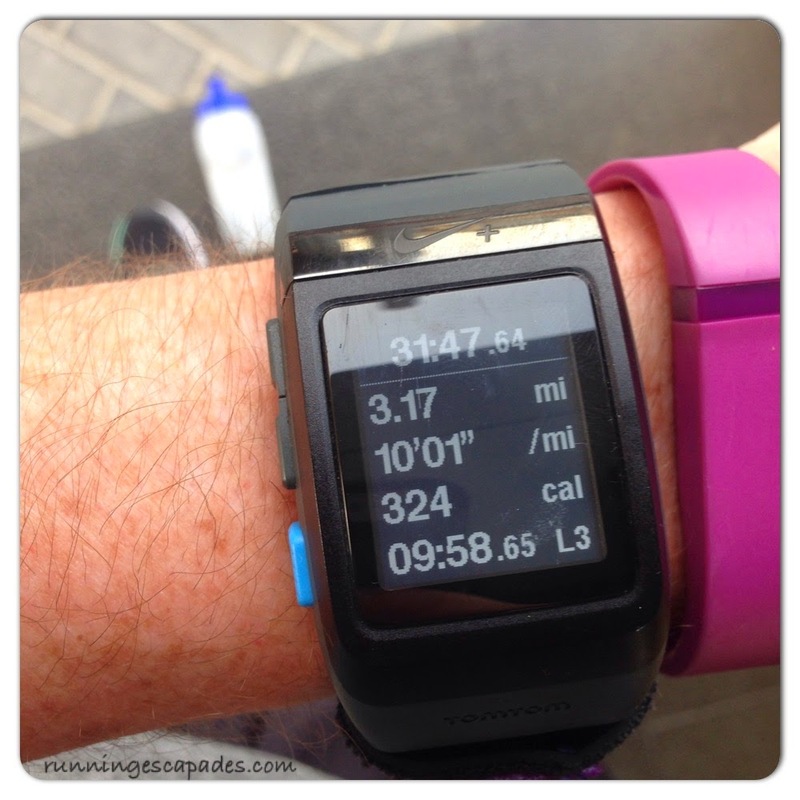 The 3K race was not chipped timed, but instead numbers were manually recorded at the finish line. It was a blessing that mrC's class schedule opened up and he could go to the race with me. He is still on the no-running list following his gallbladder surgery, but we're both anxious for him to get back in his running shoes. After cooling down, we skipped the awards and made our way out to find a taxi back to the hotel. 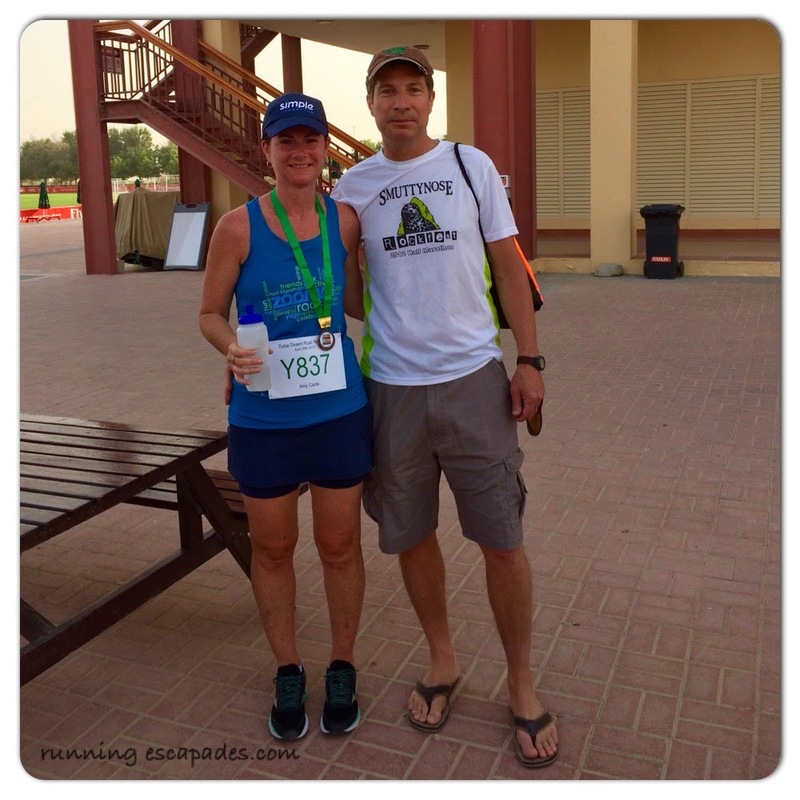 Have you ever run a race in another country? Tomorrow morning I will be running my first international race! It is freaking hot in Dubai. Including the mornings. One day it was already 88 degrees before 8AM. 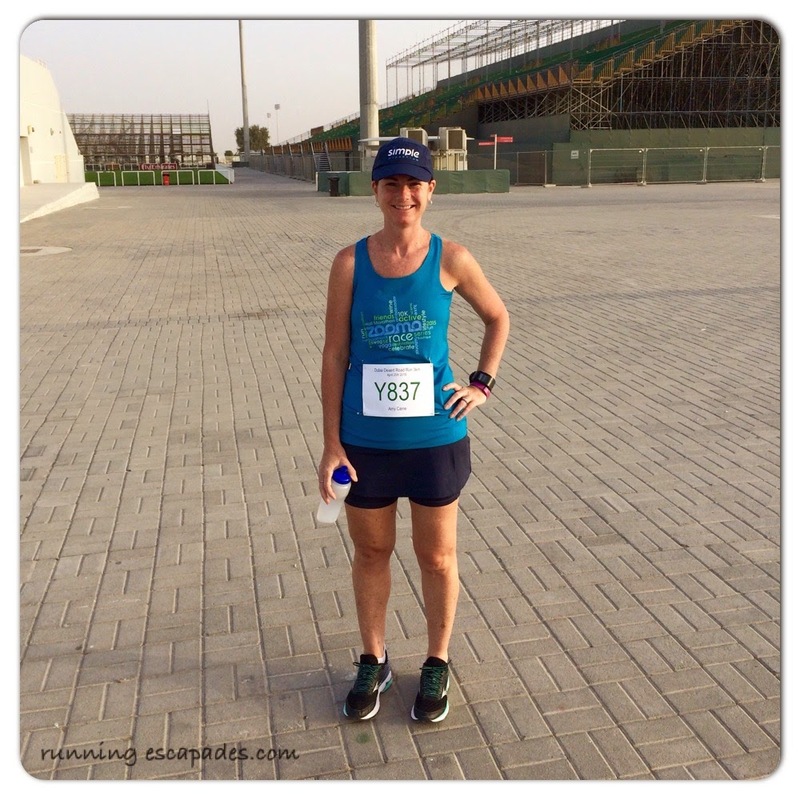 Fortunately, women can wear regular running clothes in public during a run, so picking out my race day outfit didn't feel any different than any other time. 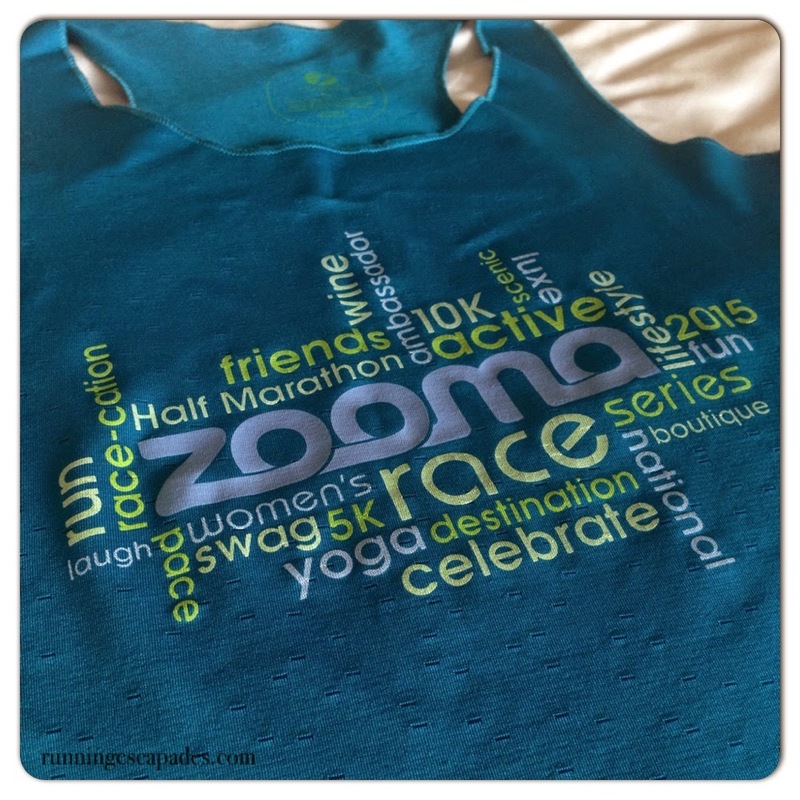 This will be the first time that I get to wear my ZOOMA Cape Cod Ambassador singlet during a race. It's a Scantron made by Oiselle. 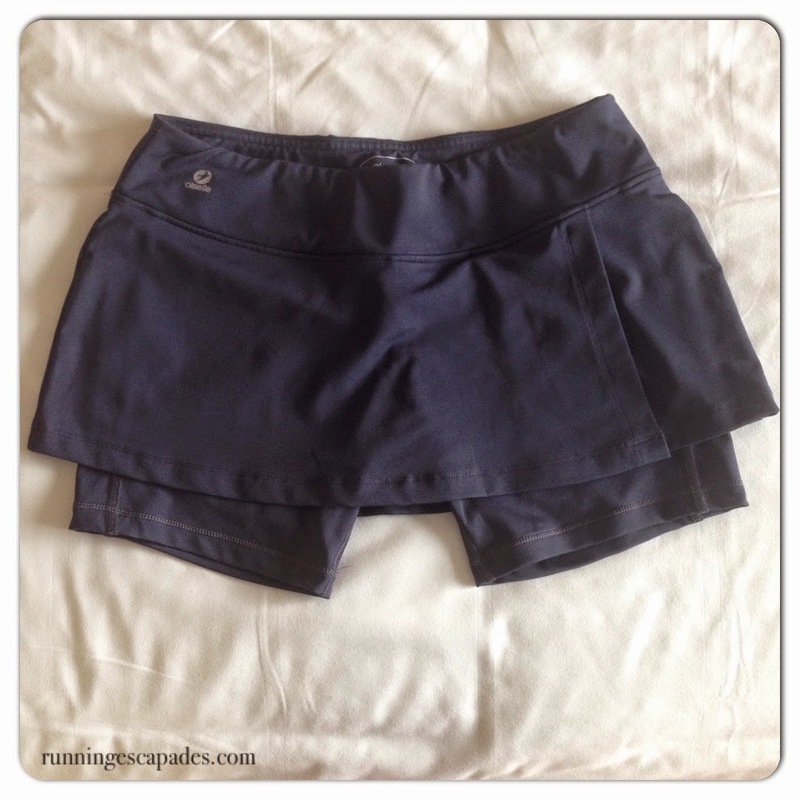 I'll also be wearing one of my favorite running skirts (also by Oiselle), the Bum Wrap. It's super comfortable. 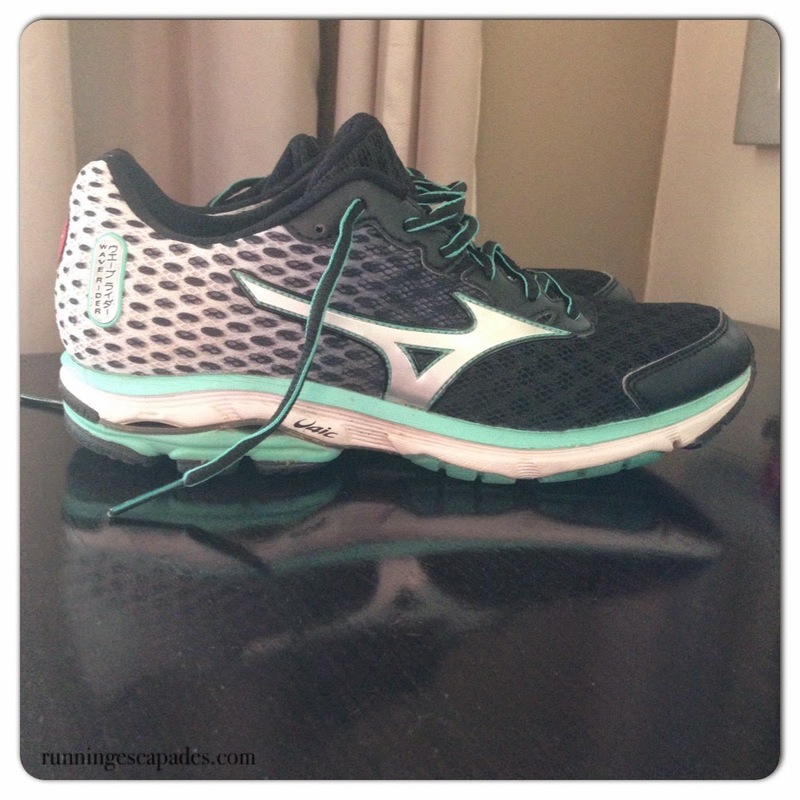 My Mizuno Wave Rider 18s, one of my favorite running shoes. 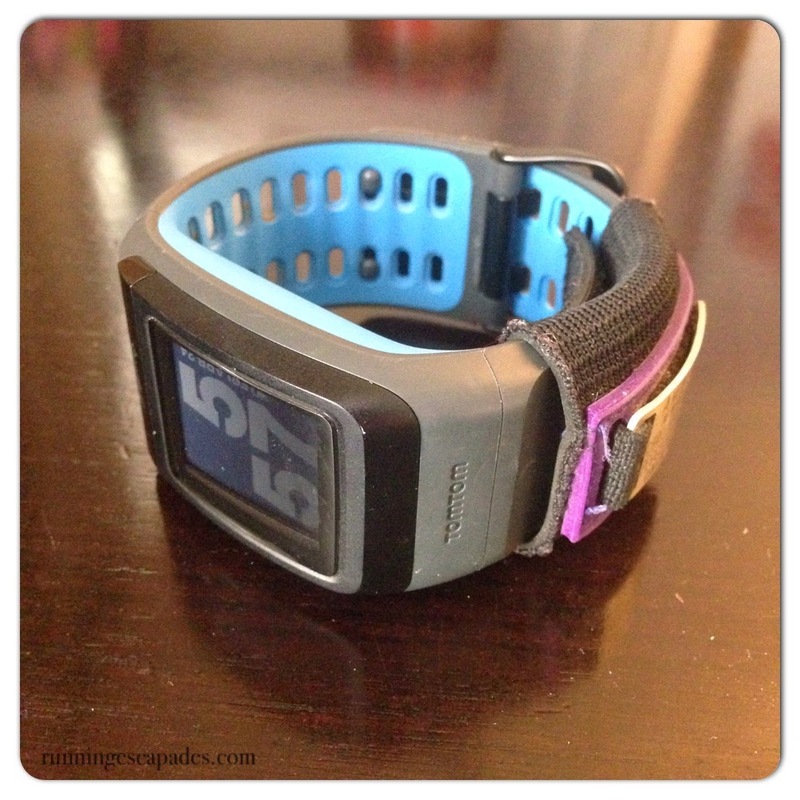 My Nike GPS watch. Because honestly, I love seeing the route mapped out after a run. 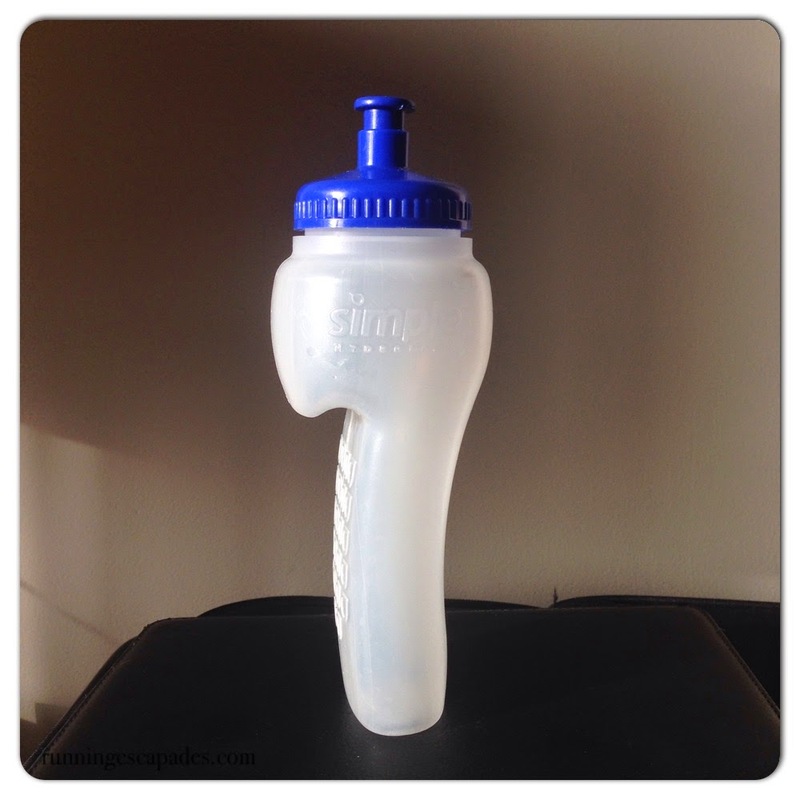 My Simple Hydration water bottle. I have to admit, it feels really good to not have to layer up like I did at my last race in New Hampshire. 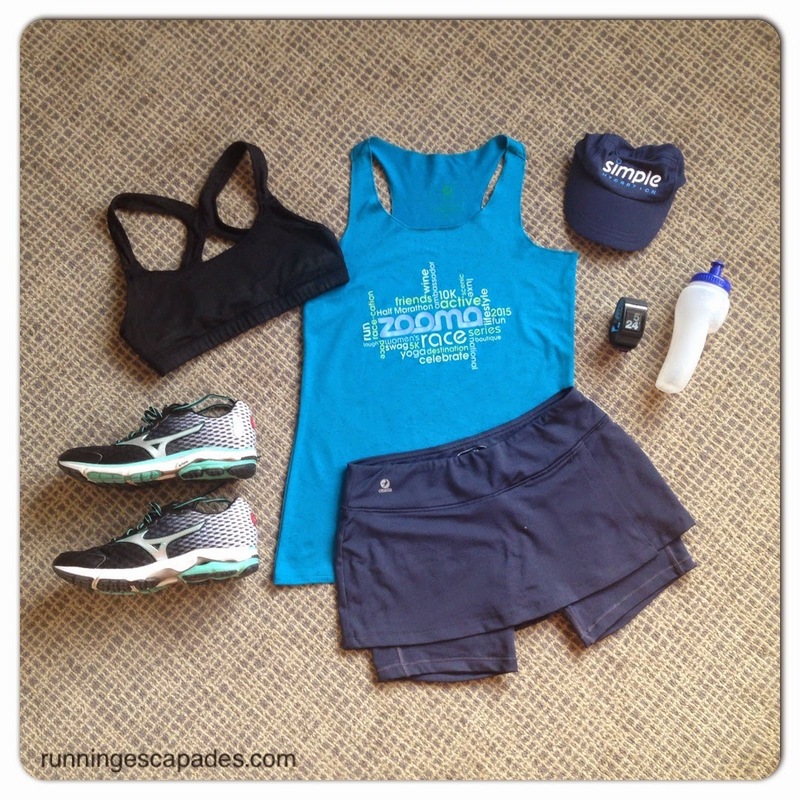 Do you plan your race day outfit in advance? 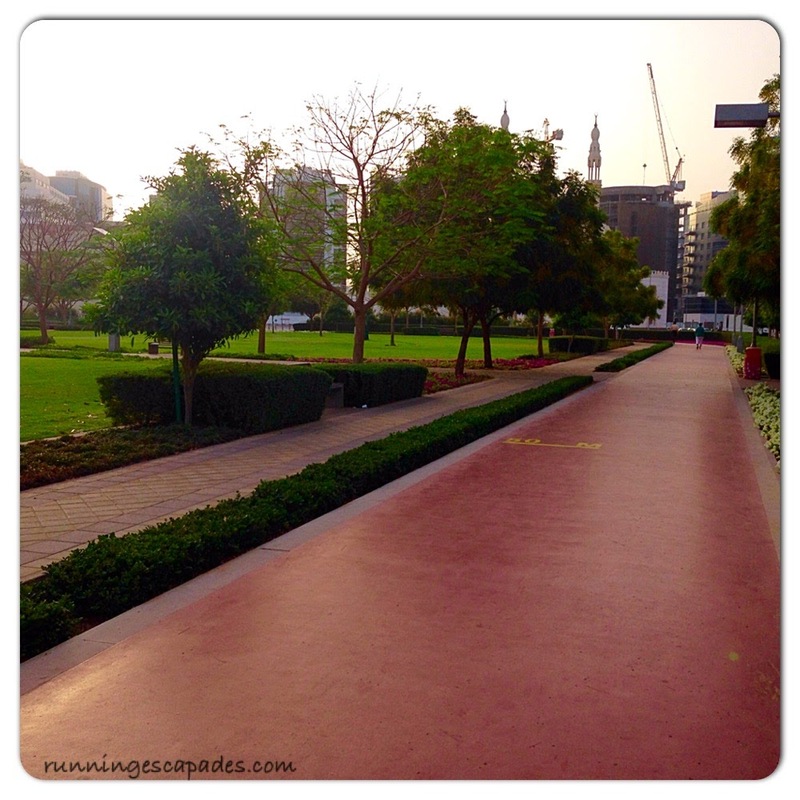 One thing I have been able to do a lot of here in Dubai is walk. 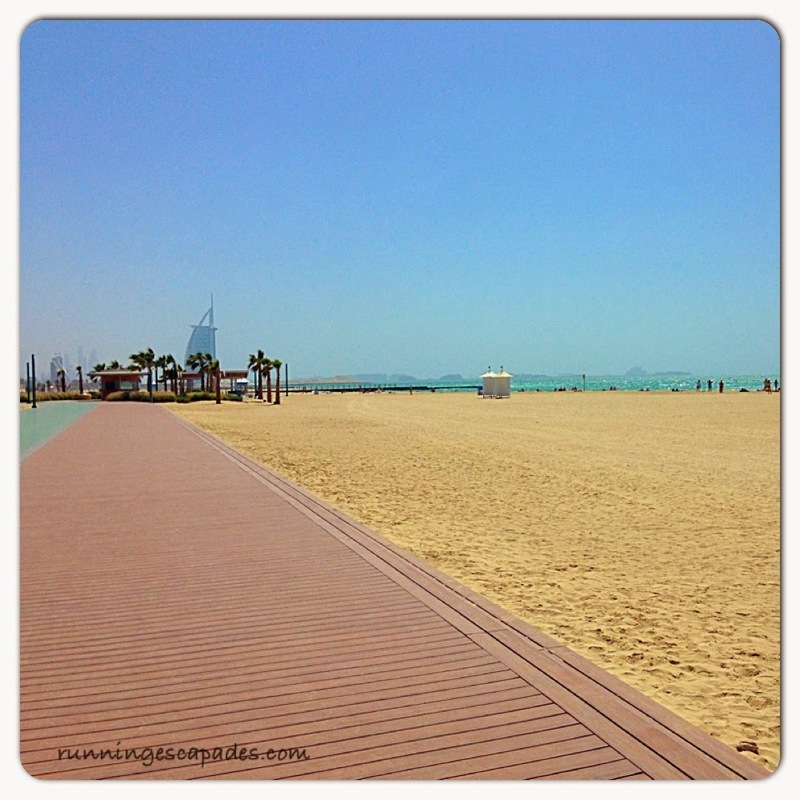 On our sightseeing adventures there are endless sidewalks and the public beaches are lined with boardwalks. 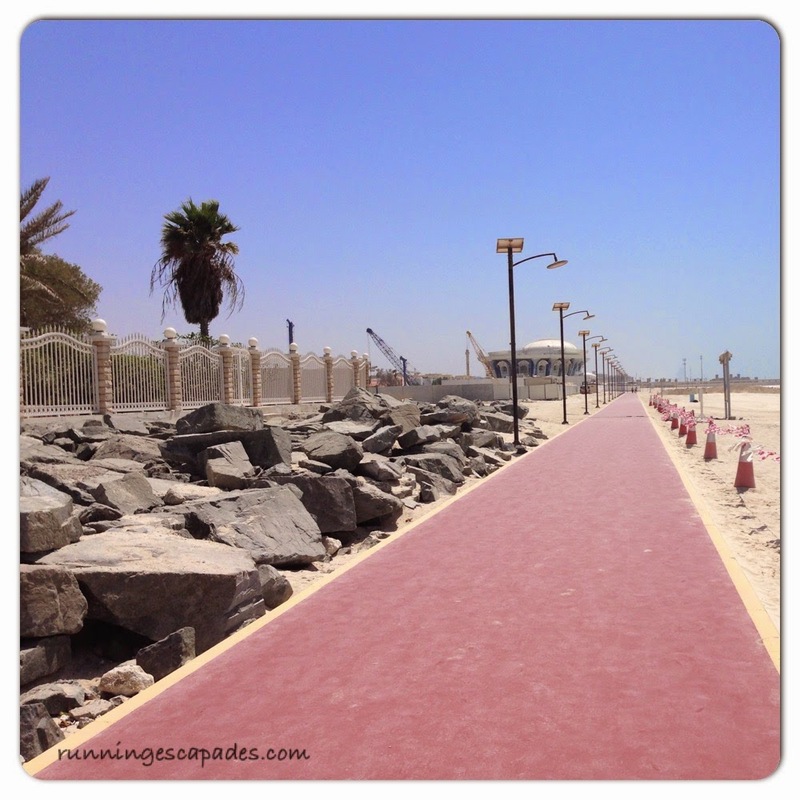 On top of that, there are kilometers and kilometers of jogging paths (going with the UAE language here) including along the beaches. I was completely impressed with the miles of rubbery running paths and then we we found the outdoor gyms. 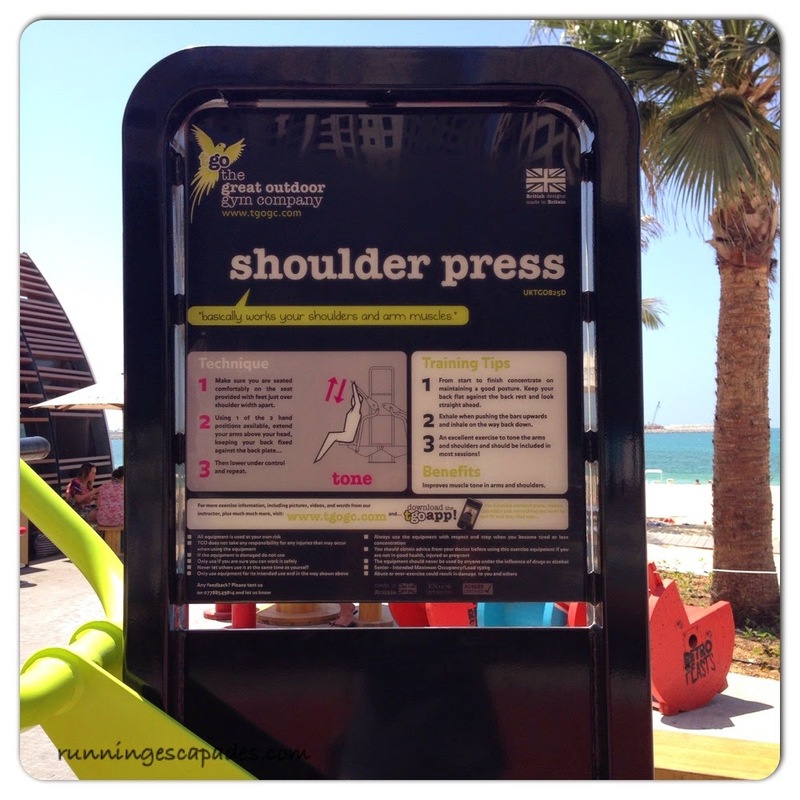 These stations are placed up and down the beach along the boardwalk and are free to use. I love a good outdoor workout. Love the directions provided at each station. But wait, there's more! On our last outing we found an outdoor gym that mrC said was similar to Venice Beach (never been there so I wouldn't know). Next to it was a small storage with bikes used during spin class. 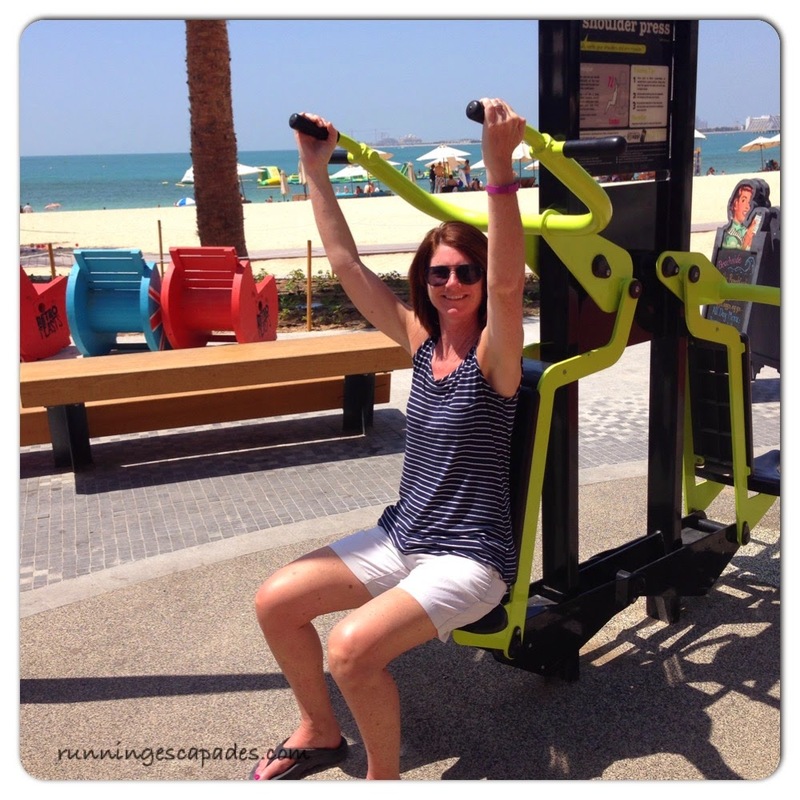 This outdoor gym is better than Venice Beach because there is staff to help people. You can read more about it here. 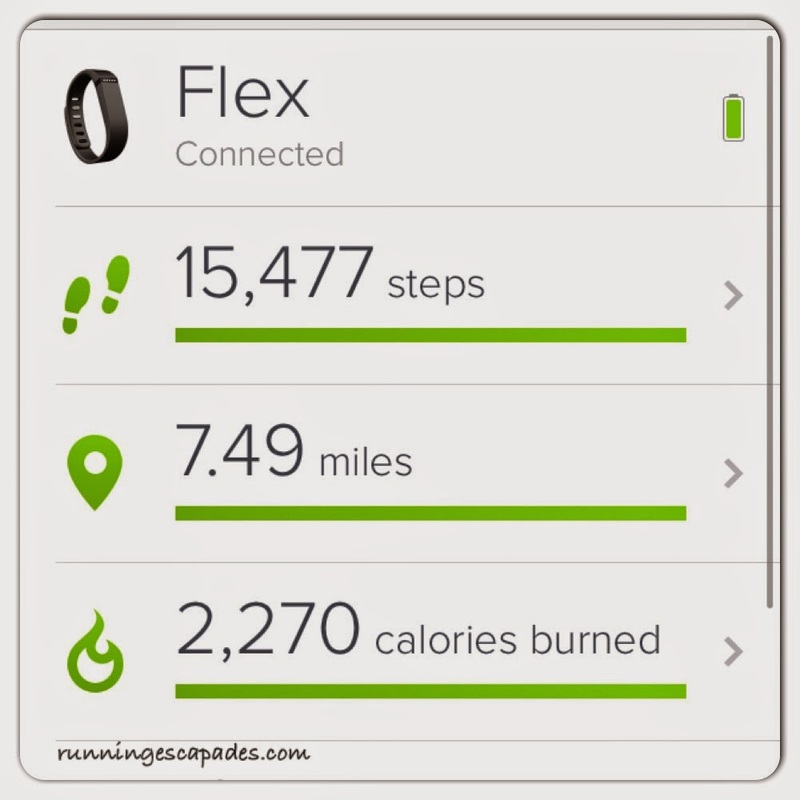 Do your parks/beaches have workout equipment? 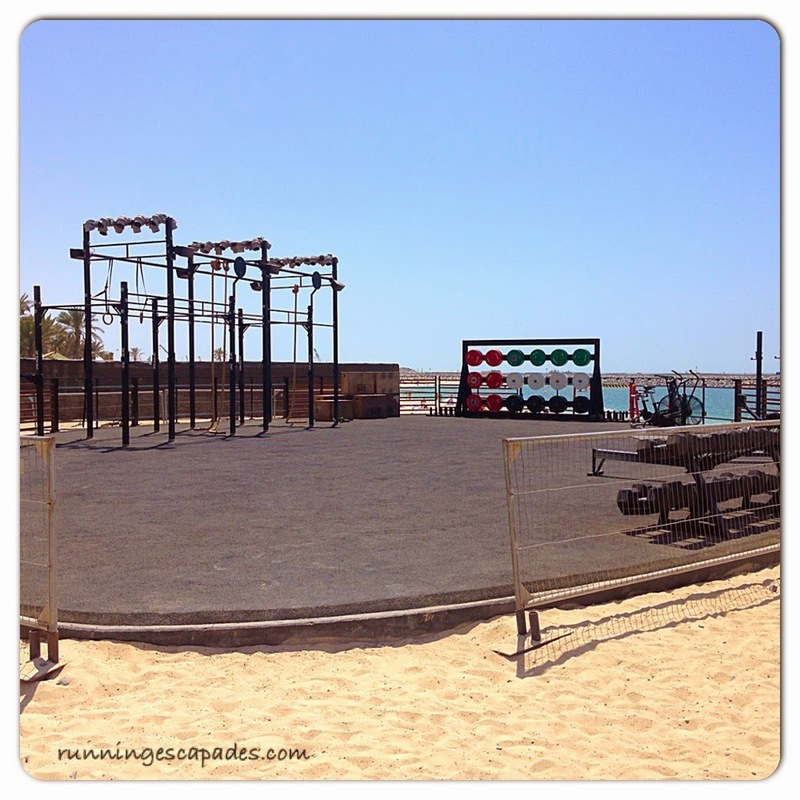 Would you use an outdoor gym? 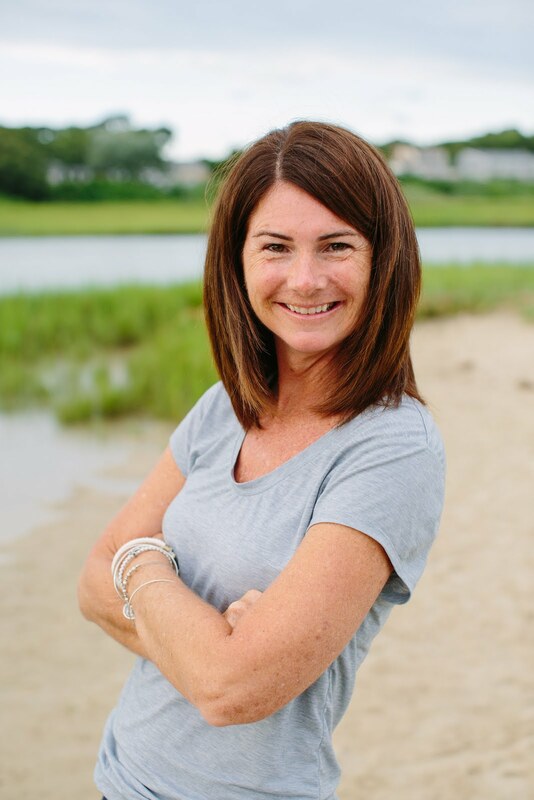 It's Marathon Monday and I'm super EXCITED to support my #BostonStrong runners today via the BAA LIVE stream. 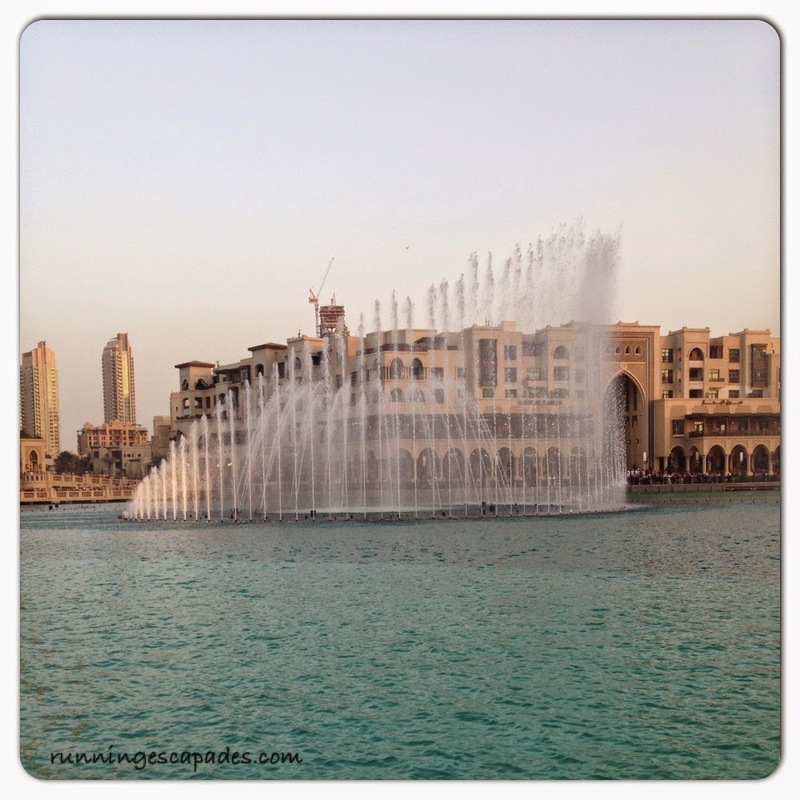 Last night mrC and I went back to the Dubai Mall for some dinner on the Waterfront and to see the famous Dubai Fountain Show. We had dinner at Carluccio's, right on the promenade and watched the first 3 minute show while having dinner. Since the show is every 30 minutes, we walked around to watch from different spots and saw the show three times. 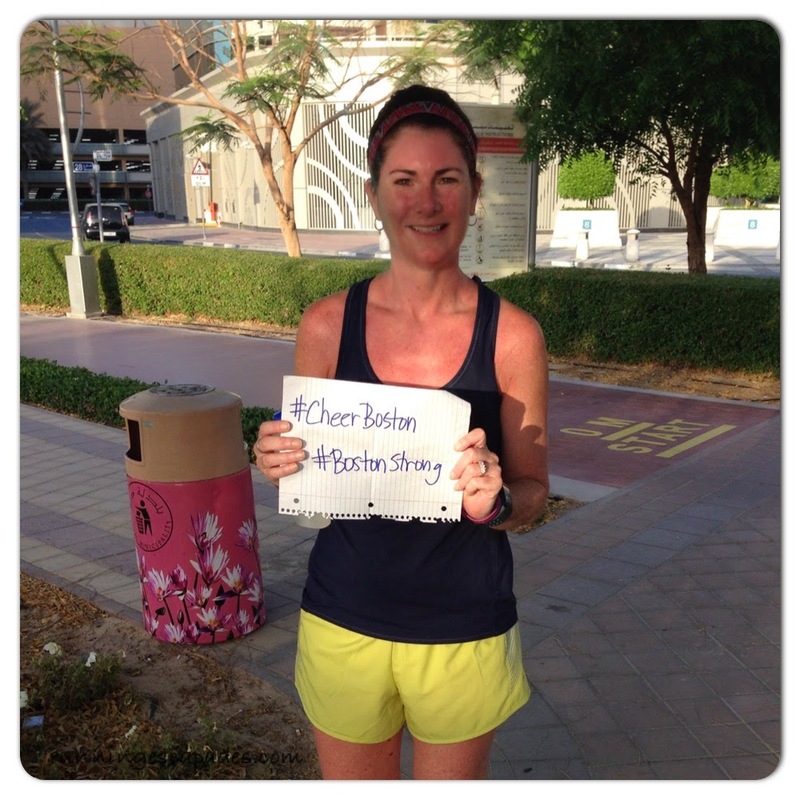 This morning, I joined my GMMRTT friends for a virtual Boston Strong 2.62 Miles to support all the runners of the Boston Marathon. I am so happy for ALL of the runners, but especially my running friends, my MRTT peeps, and my fellow running bloggers. 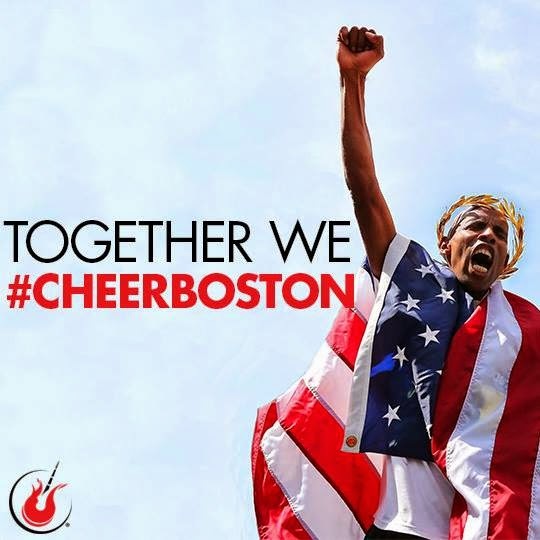 Do you know someone running Boston today? 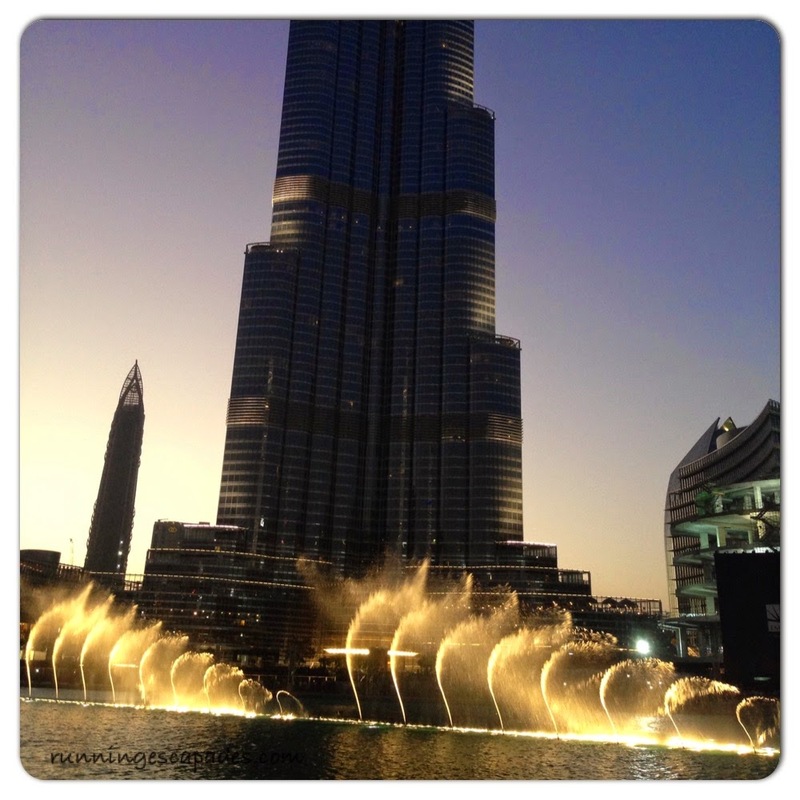 The weekend in Dubai is Friday and Saturday. Fridays are holy days in the Islamic culture, so all offices and schools are closed. 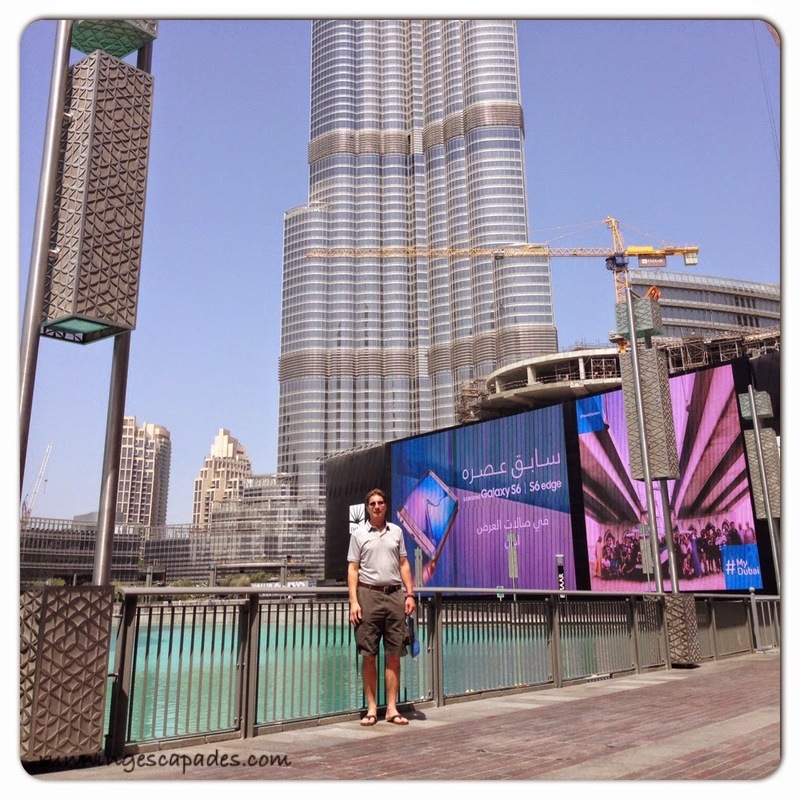 On Friday, mrC and I went to the Dubai Mall to see the Burj Khalifa, the tallest building in the world. We purchased our tickets online (about 35 dollars each) to guarantee a spot at the time we wanted. 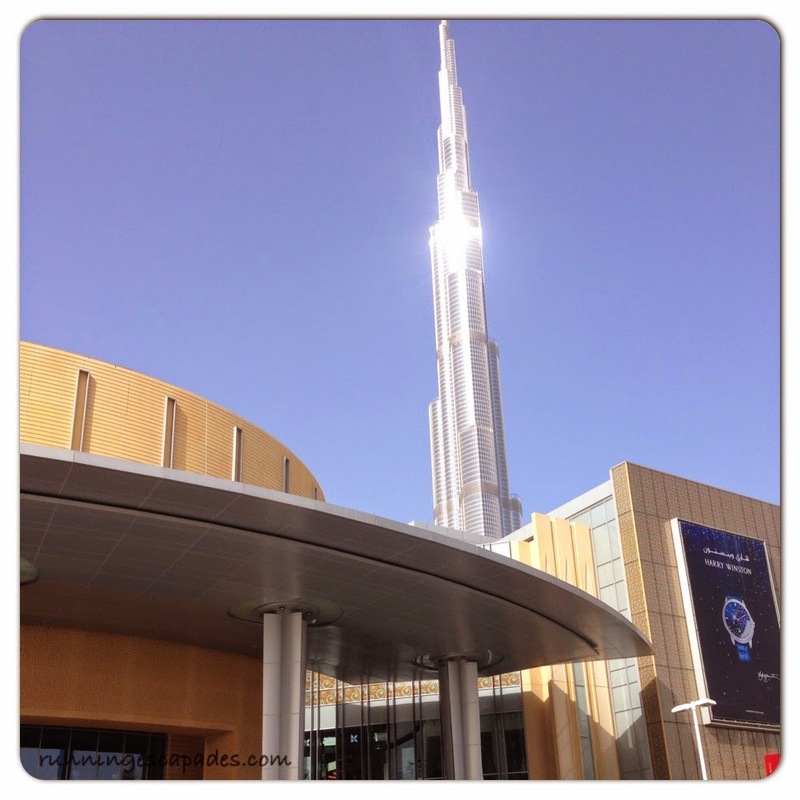 The entrance to the Burj Khlifa is located near the food court of the mall. We printed our tickets at the online kiosk, grabbed a cup of Caribou coffee, and waited for our time slot. After going through security, we made our way though a series of hallways displaying information about the construction of the tower to the high speed elevator area. 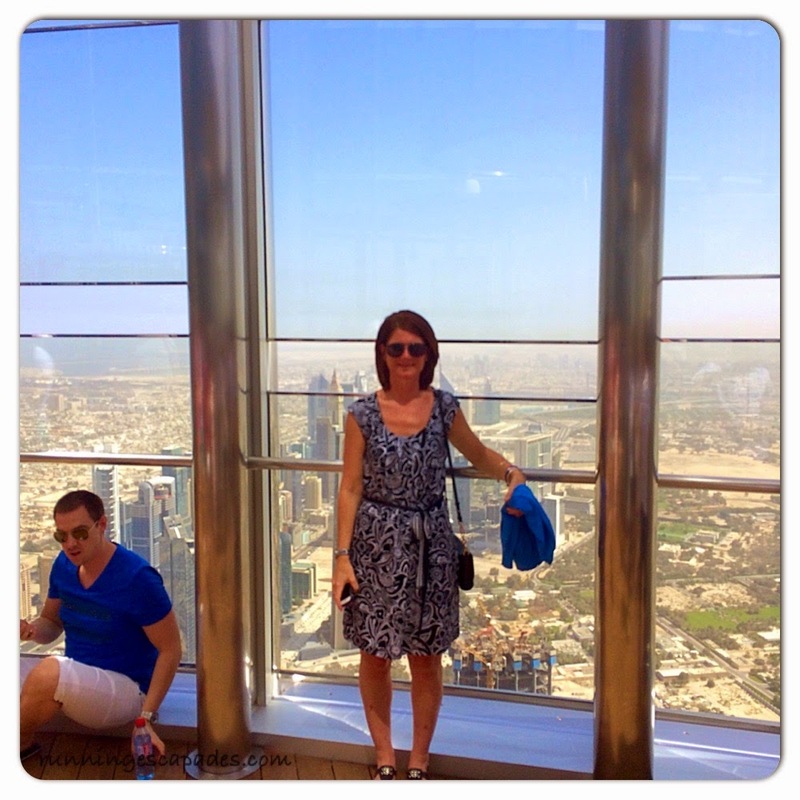 We took about a one minute ride to the 124th floor observation deck. The views were amazing! 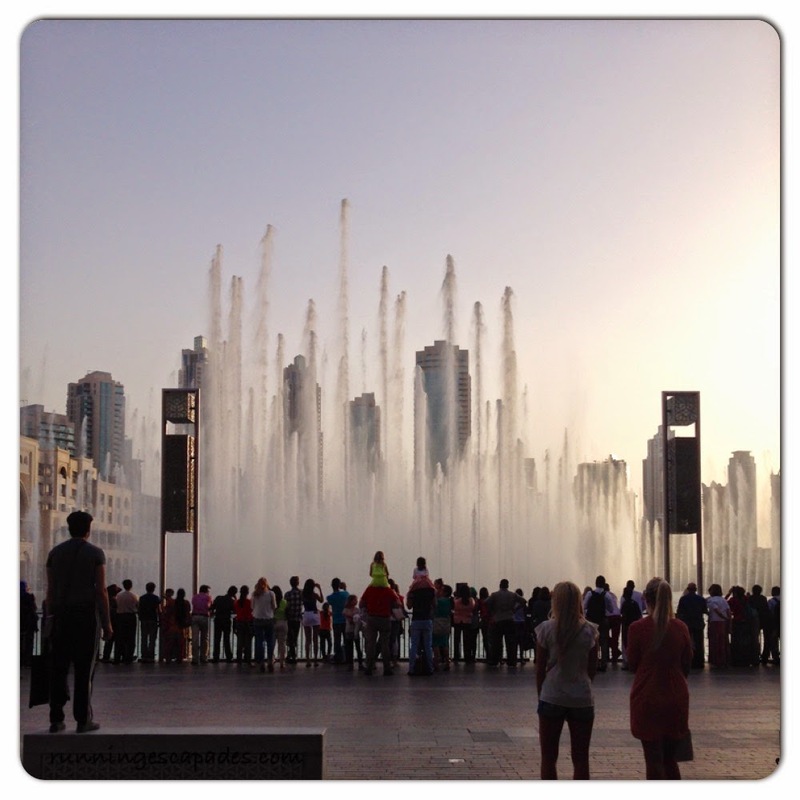 Afterward we walked around the waterfront and scoped out places for when we return for dinner and to watch the Dubai Fountain show. Before leaving we walked around the mall a little. The Dubai Mall is huge. 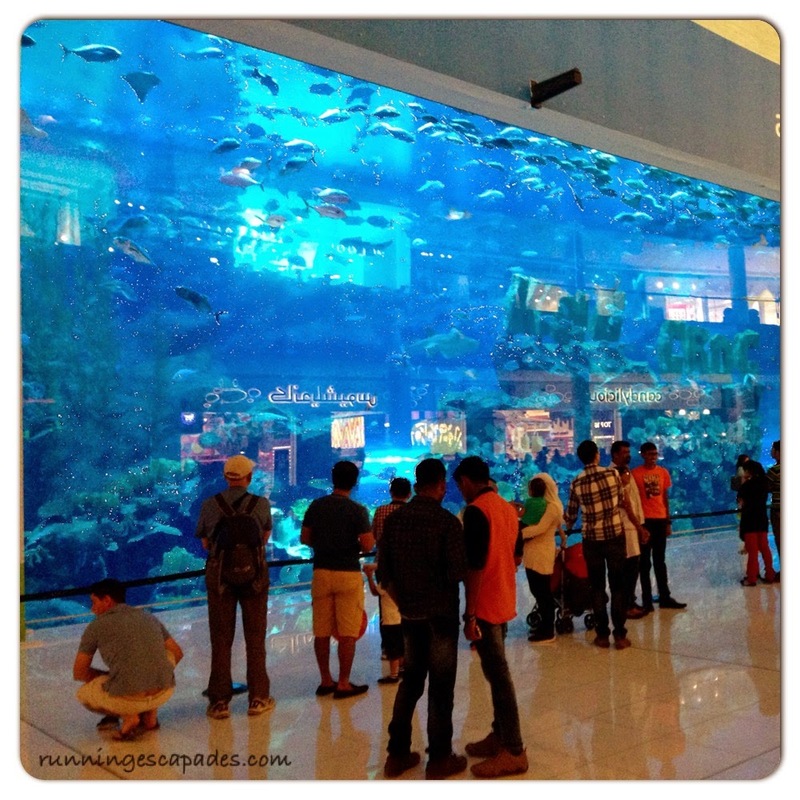 In addition to the traditional shopping, inside you will find the Dubai Ice Rink, Fashion Avenue where you'll find 70 luxury brand flagship stores (think Chanel, Versace, Hermes, Jimmy Choo), a real dinosaur skeleton exhibit, a flight simulator, the Dubai Aquarium and Underwater Zoo and more. With all that walking I hit 10,000 steps on my Fitbit before dinner, but the darn thing is having trouble syncing here in Dubai. Sadly, most of my days look like I have had ZERO steps. 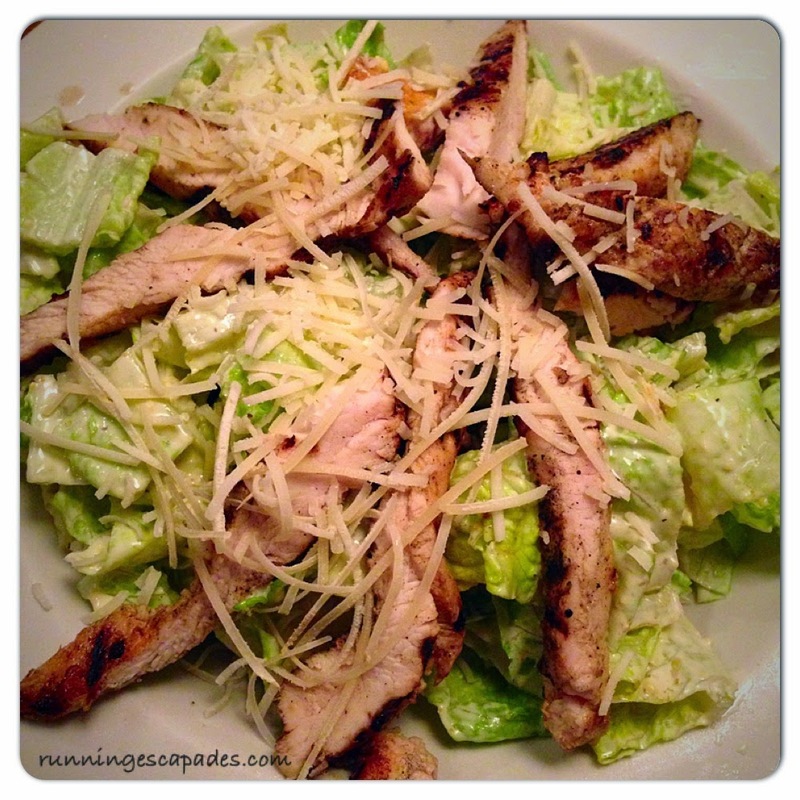 Speaking of dinner, we ate at Texas Roadhouse and I had the best Chicken Caesar Salad. I'm still thinking about it. Saturday was a lazy day for me. mrC had his check-ride (he passed! ), so I went for a run and did some swimming. Since it was already 80 degrees at 6:30 AM, I chose the fitness center. It was much easier than my outdoor run the other day. When mrC finished his work, we went to dinner at TGIFs (so many American restaurants!). 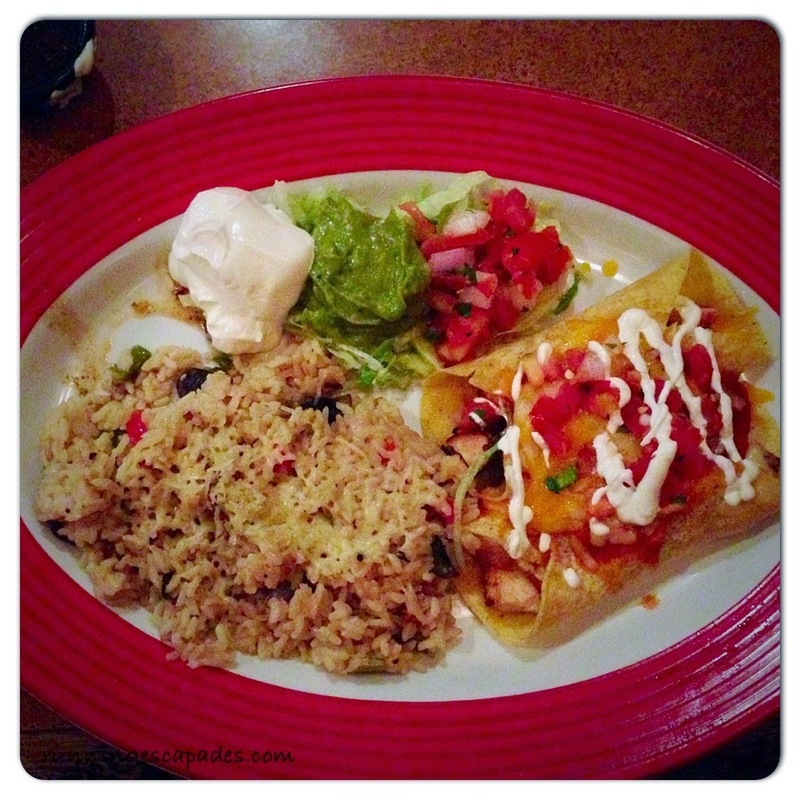 I had a so-so chicken enchilada. 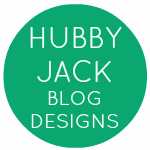 It's nice to eat out and not have to clean up, but I'll be happy when we are settled and have a kitchen of our own. After another simple buffet breakfast at the hotel Sunday morning, mrC and I took a walk to drop off some laundry and enjoy the local park. 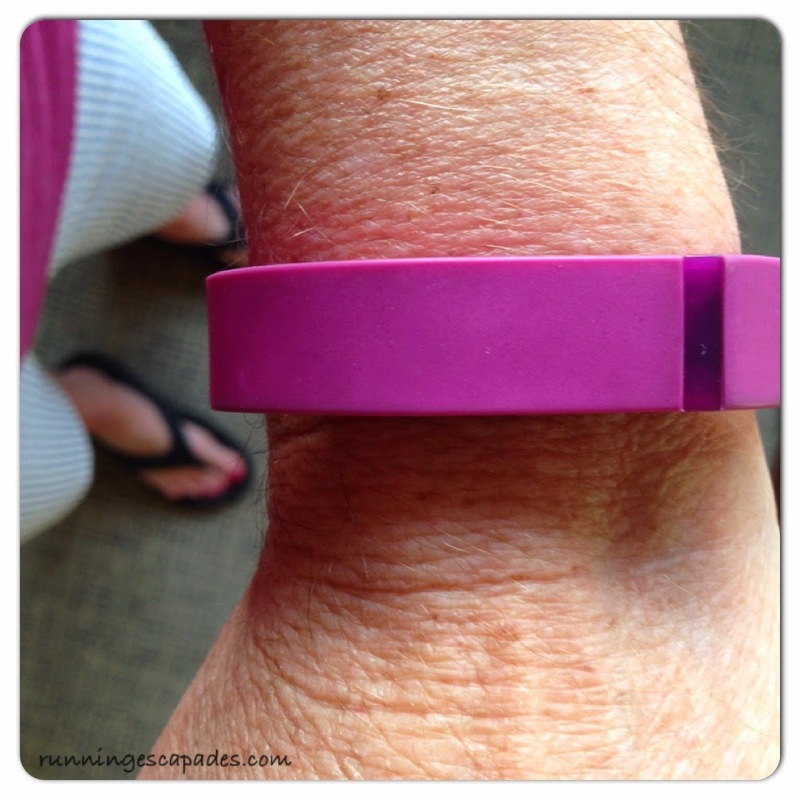 Do you track your daily steps? What's the biggest mall you've been to? Morning workouts are my favorite thing. 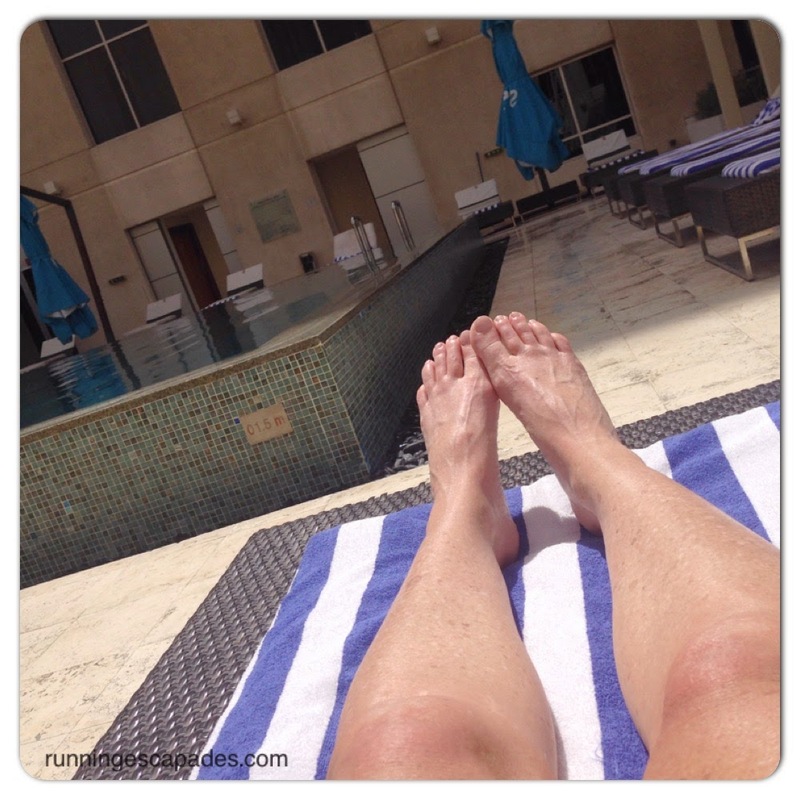 Since yesterday was a non-running day, I decided to do some planking by the pool. Off the top of my head I did as many variations as I could: basic, side, spiderman, with leg raise, side with hip dip, knee taps (cha chas). Most of them are included here. Now, I've read about people using pool running as a way to maintain fitness through an injury, but I've never actually tried it myself. The closest thing to it that I've done is try out the Alter-G Anti-Gravity Treadmill. There are two types of water running: shallow water (low impact) running where your feet touch the ground and deep water (no impact) running where your feet do not touch the ground. 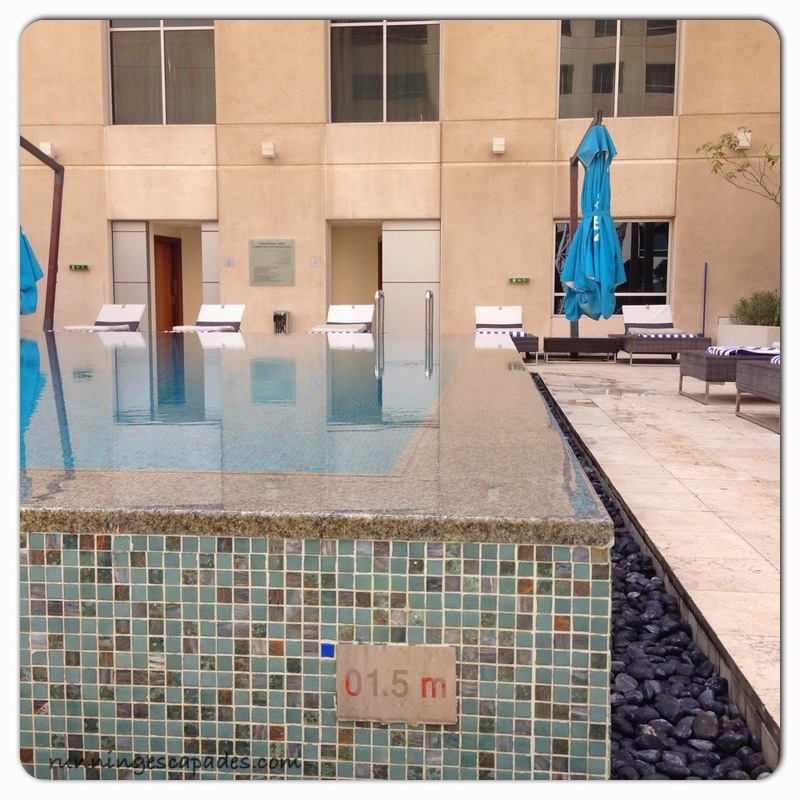 Since the hotel pool is 1.5 meters (almost 5'), my feet touch the ground, although most of my body is submerged. 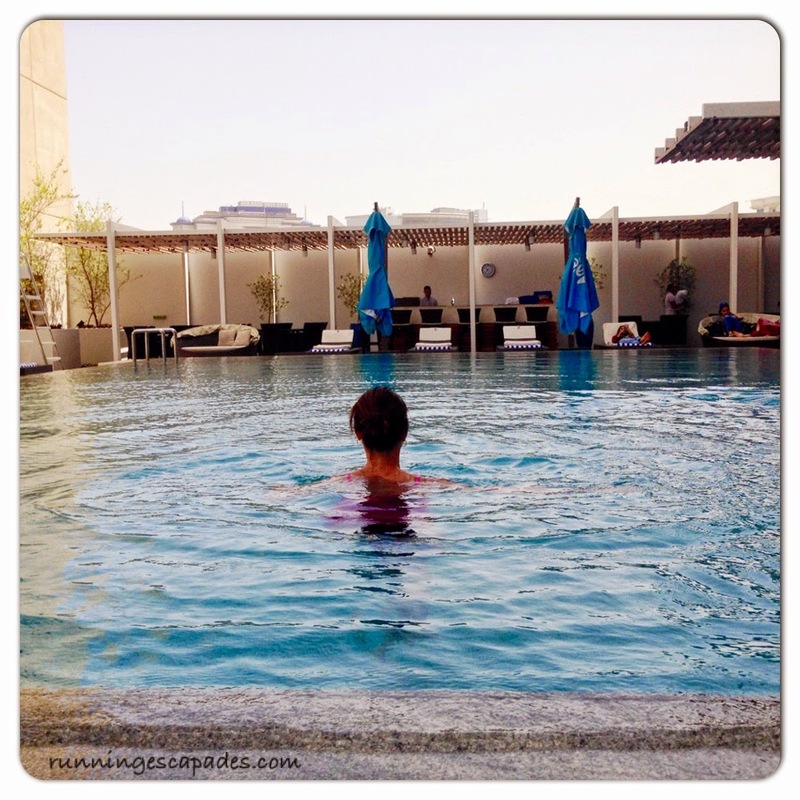 After warming up with the plank work, I climbed into the pool for some running. Pool running is not as easy as it sounds and in fact, you don't actually move around all that much. The main idea is to keep your body vertical and pump your legs by driving your knees up as fast as you can while swinging your arms just as you would while running. After 30 minutes of what I would generously call "interval" pool running, my legs felt like jello. 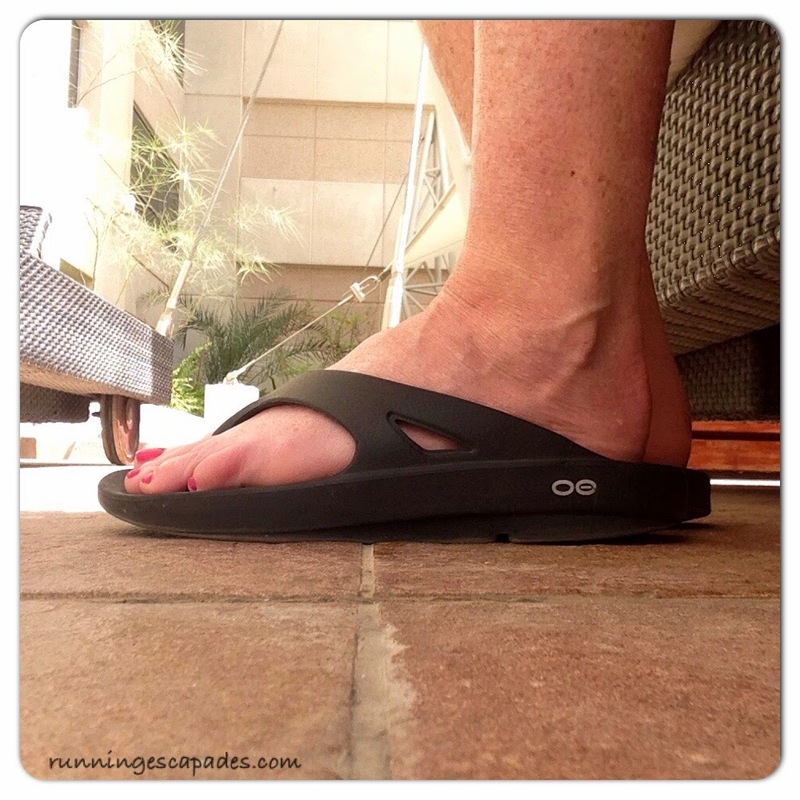 Good thing I packed my favorite bouncy Oofos recovery flip flops to take with me to China. These things make walking with sore or tired legs feel so much easier. 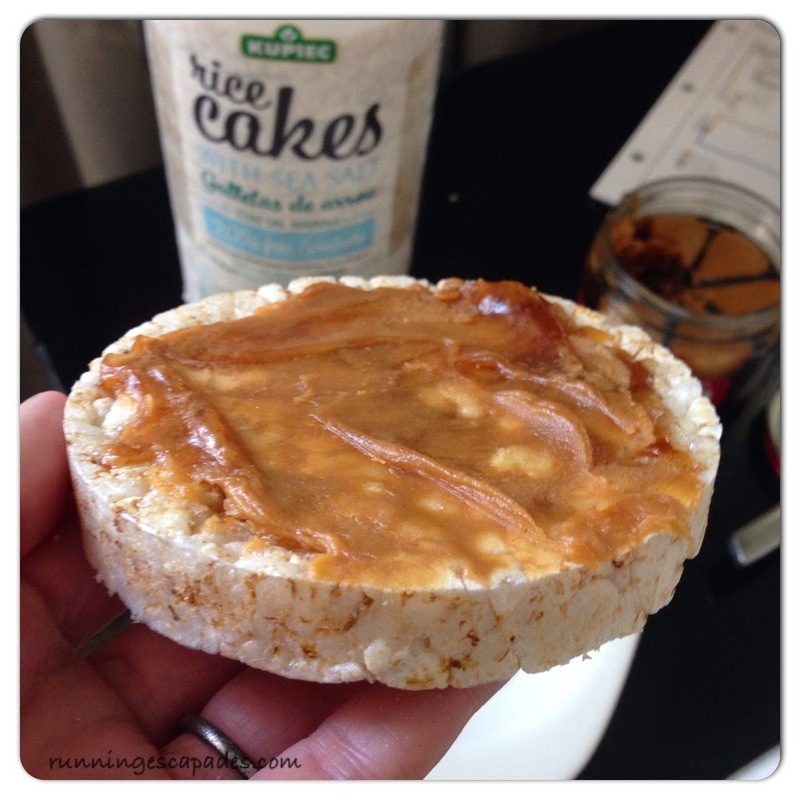 It was peanut butter and jelly rice cakes for my post-workout snack win. We found these and the Smuckers Goober strawberry jar of pb&j stripes at ZOOM, a local market down the block from our hotel. What is your favorite rice cake? Since arriving in Dubai, I've been worrying about wearing acceptable running gear, the heat, and where to run in this busy city. 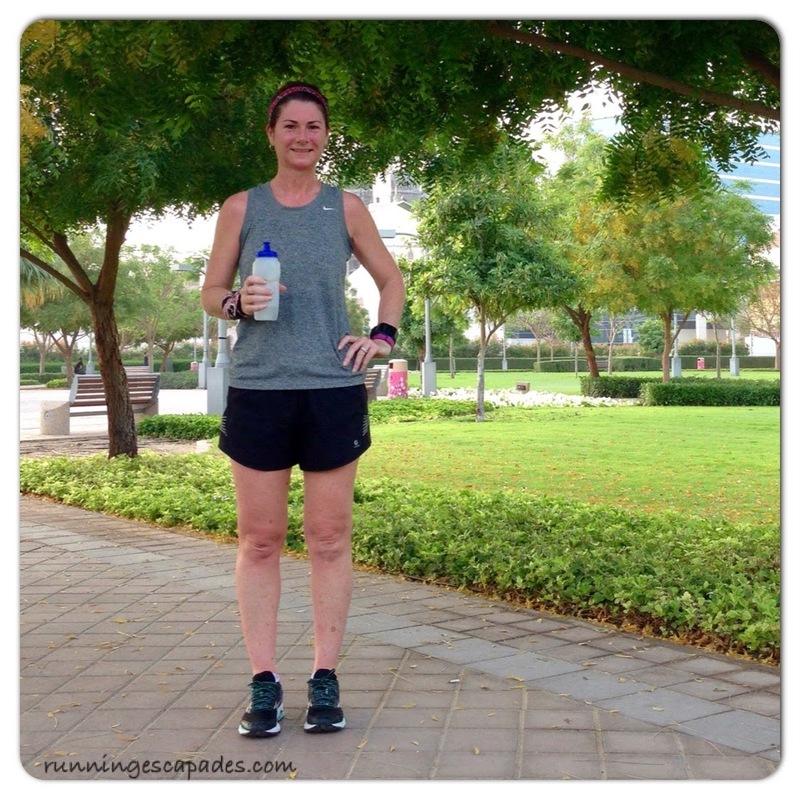 After taking an extra day off to let my sore legs recover, I was itching to run again on Wednesday morning. 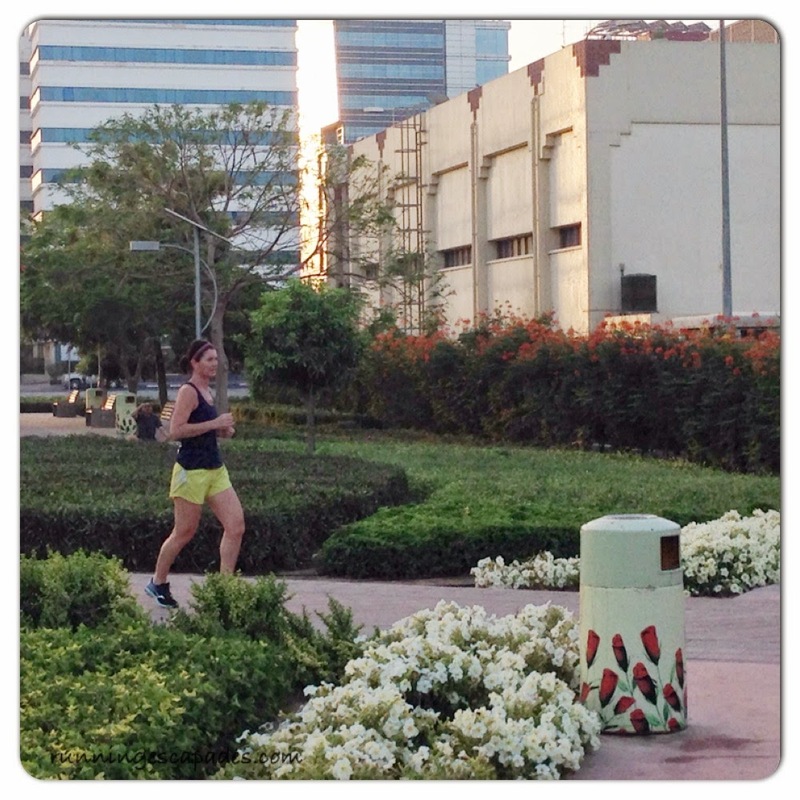 A couple expats living in the area have assured me that it is acceptable to wear modest running gear while you run. 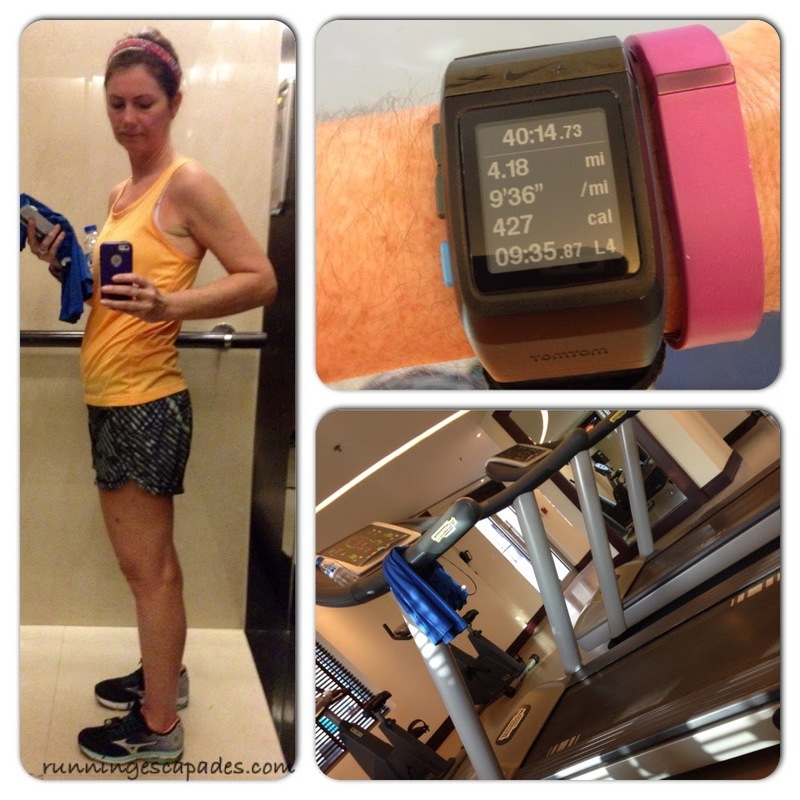 It is not acceptable to wear your running gear into public places, like the mall or grocery. 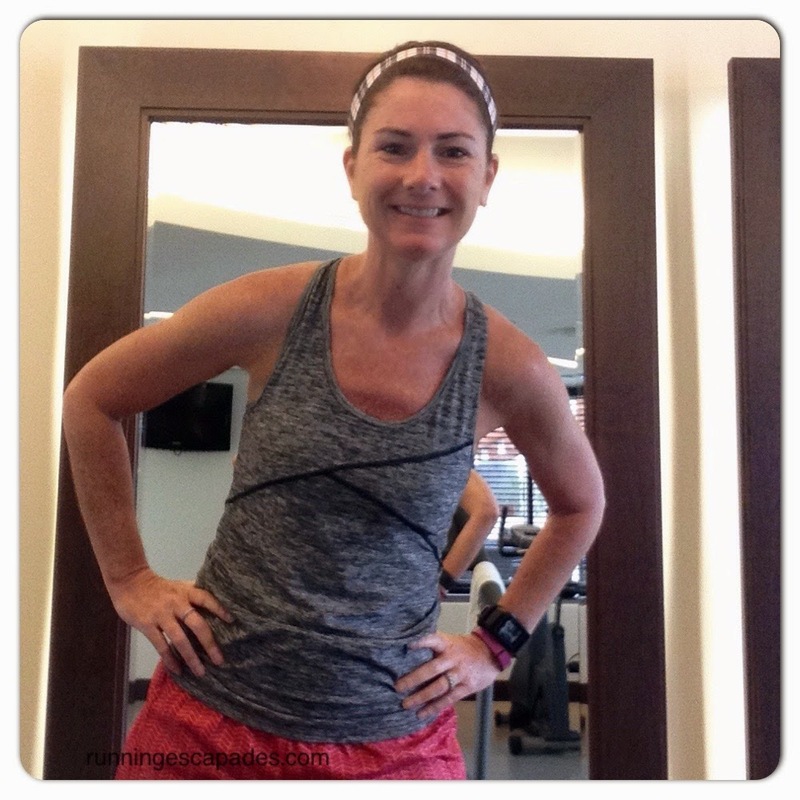 Although I love a good racerback when it's hot and humid, I opted to wear a regular tank top with my trusty Oiselle Distance shorts. To beat the heat, I got up early and thinking about my GMMRTT early-bird runner friends, I was out the hotel at 6AM. It took my Nike GPS watch about 5 minutes to find a signal, which seriously stressed me out because I was standing on the sidewalk in my running gear. NOT running. The other day, mrC glanced out of our hotel window (we're on the 9th floor) and noticed a small park with a running track. 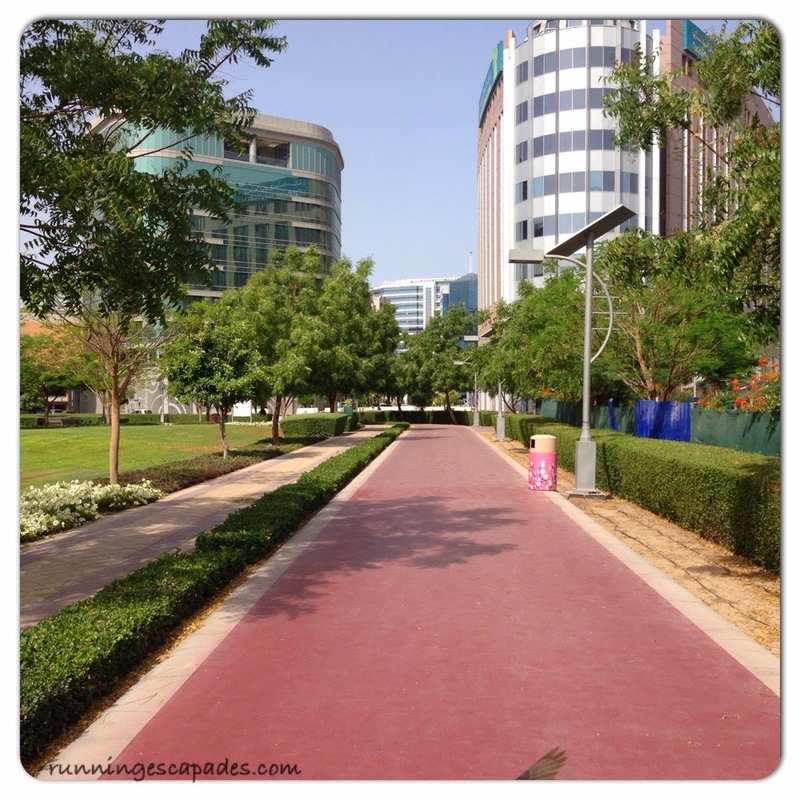 The 400 meter rubbery track circles around the outside of Port Saeed Plaza and is lined with flowering trees and bushes like jasmine and honeysuckle. I left the hotel with a goal of running for 30 minutes, but knowing that my body is still acclimating to the temperature change. For example, it was already 74 degrees at 6AM! I didn't count laps while I was running, but instead watched my time and took water breaks every 10 minutes. I ended up with 11 laps around the track before making my way back to the hotel. 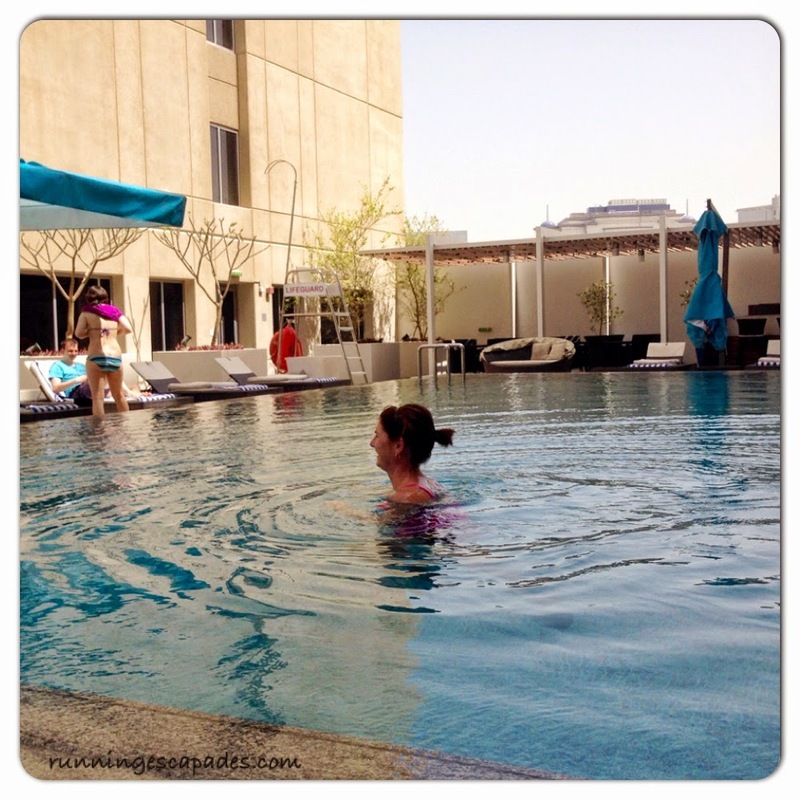 After a quick shower and some breakfast I headed to the pool to do some laps there. I don't know the length of the pool, but I did 5 laps (back & forth = 1) twice. Swimming is fun, but it's not easy. It's definitely more cardio than I remember as a kid! I haven't done a lot of swimming while living in New Hampshire, so I'm thoroughly enjoying this time in the pool. Hopefully, we will have access to one in China too. Does your GPS take a long time to connect? Do you like running around a track? We Made It To Dubai!